Cream butter and sugar together, add the egg and vanilla extract and mix in well, fold in the flour. Cover with clingfilm and rest in the fridge for 30 minutes. 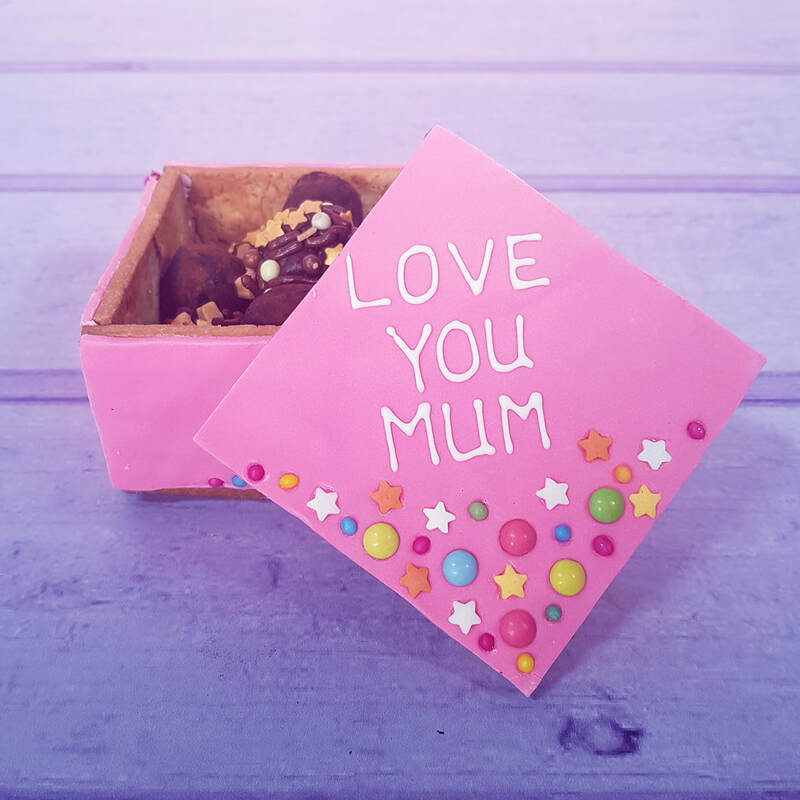 Roll out the biscuit dough on a piece of baking paper to 3-4mm thick, cut out the panels for your box and lid. Remove the excess dough and place onto a baking tray and chill for 30 minutes. Bake at 180C for 10 minutes, turn the biscuit around and bake for a further 5-10 minutes until the edges have turned golden brown. 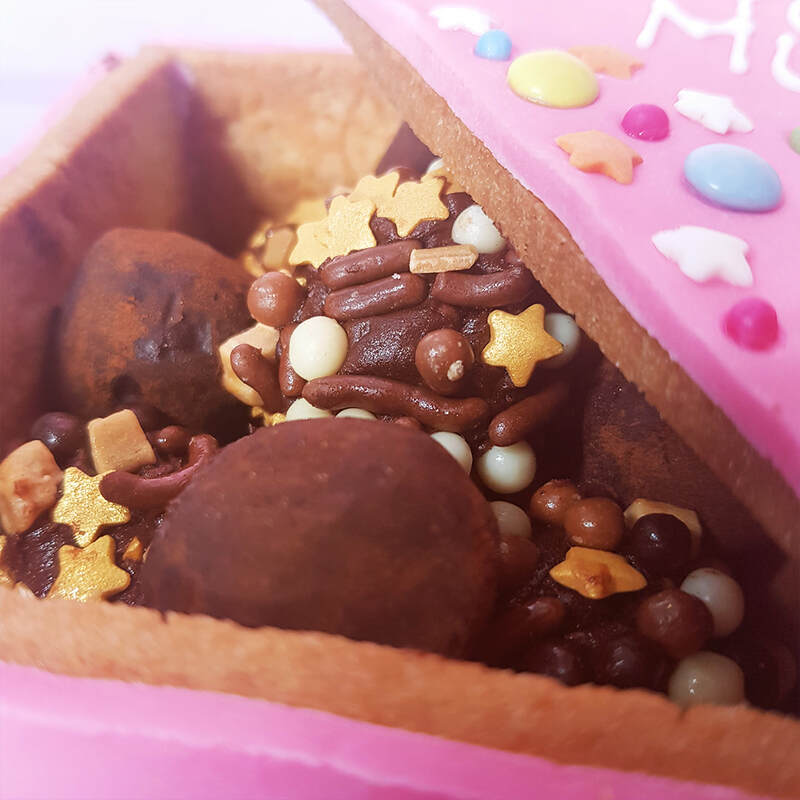 Roll out the fondant to approximately 3mm thick and use the biscuits as a guide to cut out the right sized shapes. Arrange the Rainbow sprinkles in your desired pattern on the fondant and fix in place with edible glue. In the meantime, mix some pink food colouring into half the Royal icing and match it to the shade of the fondant. With the remaining white royal icing pipe, a message to your mum. Line a tray with paper and pipe rosettes of frosting in lines, press a piece of popping candy into the frosting and chill until firm. Roll the frosting around the popping candy and then roll the truffle in cocoa powder to seal. Squeeze the other half of the frosting pouch into a bowl and fold in Zillionaires sprinkles, spoon the mix onto the tray and chill until firm. Roll the truffle mixture into balls and then press more Zillionaires sprinkles onto the outside of the truffles to seal.